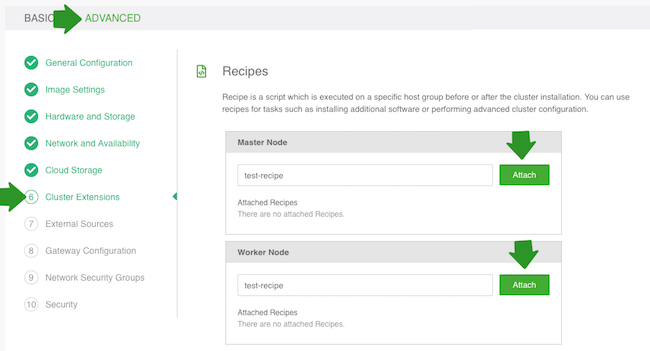 In order to use your recipe for clusters, you must first register it with Cloudbreak. Place your script in a network location accessible from Cloudbreak and cluster instances virtual network. Select External Sources > Recipes from the navigation menu. Name Enter a name for your recipe. Description (Optional) Enter a description for your recipe. pre-ambari-start: The script will be executed prior to Ambari server start. post-ambari-start: The script will be executed after Ambari server start but prior to cluster installation. post-cluster-install: The script will be executed after cluster deployment. pre-termination: The script will be executed before cluster termination. File: Point to a file on your machine that contains the recipe. URL: Specify the URL for your recipe.